Home» Posts tagged "Peace Walker"
North America will be getting a exclusive collectors edition of Metal Gear Solid: Peace Walker. GameStop has revealed that the collector’s edition at $49.99, and contains not only a copy of the game, but it will also include a 35-40 page exclusive artbook. Metal Gear Solid: Peace Walker is almost here, exclusive to the PSP. The game pick up where Metal Gear Solid 3: Snake Eater left off, with Naked Snake (Solid Snake’s father) returning as the lead role. The game is set in 1974’s Central America, in a war-weary time at the tail end of the Vietnam Conflict, exploring the philosophical and political ramifications of war as commerce, as well as its longterm deleterious effects on society, the economy, and ourselves. The latest iteration of the Metal Gear Solid franchise, Peace Walker, has been delayed. Originally the game was scheduled to arrive in the U.S. on May 25, but has now been pushed back by two weeks. The highly anticipated portable sequel is now slated for a June 8th release in North America, June 17th in Europe and June 18th in the U.K. No further info was given for the cause of delay. If you are a Metal Gear Solid fan, this is something you don’t want to miss. 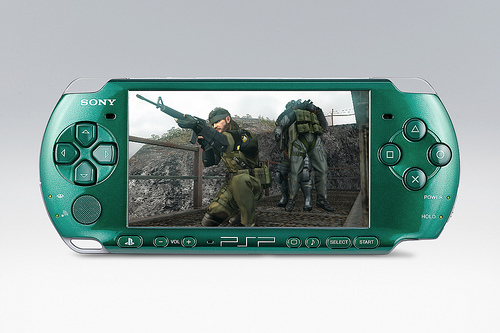 Along with the release of Metal Gear Solid: Peace Walker for the PSP, Sony will also be releasing a limited edition entertainment pack, which will contain a “Spirited Green” PSP-3000 system and the game on UMD.